There are networks and there are networks. Building and maintaining a network of sites takes dedication, drive, and experience. We have invested endless hours over many years to create, launch and build a successful network. The CBM Christian Book Marketing network shares the love and redeeming passion of Christ, salvation, the Word of God, encouragement and hope with the nations of the world and has both a national and international readership. We believe that God has blessed us with the humble privilege to share His Kingdom and look forward to sharing the pearls that God has sown into your hearts and the pages of your book. Remember, together, we can all make a difference for Christ. 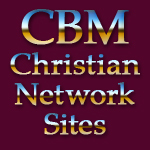 Our network of Christian sites have been online for many years, have a huge online presence, both a national and international following and readership providing the Christian author with targeted marketing within a well established Christian network of sites. Our author book related sites cover such topics as authors, books, new book releases, publishing, writing, book reviews, book trailers, author press releases, encouragement, hope and everyday topics that attract book lovers and readers. Our author book related sites are all Christian related sites that further tap into the Christian marketplace. From health, nutrition, communities, national and international topics, to daily news releases, family, trends, products, services and even frugal buying our everyday life and topic sites cover a variety of subjects for the readers pleasure.